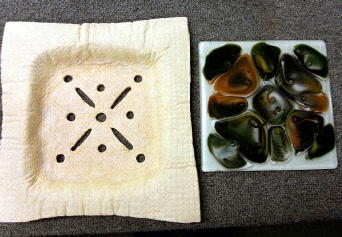 SilkeMat is a Non-Carcinogenic refractory fiber blanket that can be cut, molded, rigidized and formed into any shape you can make for use in a kiln to slump glass. It can be used with or without rigidizing. Although a high-grade boron nitride separator like ZYP could be used for glass firings, it is not necessary. 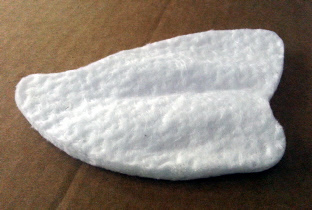 There is no "shot" in this product and most firings are clean, leaving only the texture of the fiber on the glass. 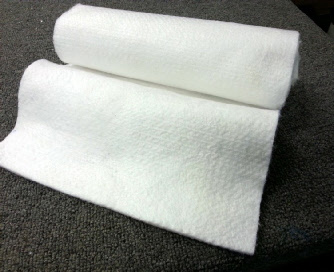 Since SilkeMat is a Non-Carcinogenic material, it can be cut and handled with minimal concern. Once rigidized, the product can even be cut or drilled to make pot molds! 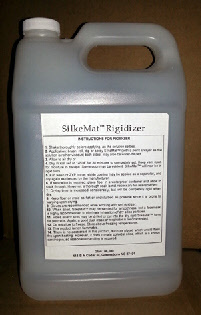 The SilkeMat Rigidizer is is NON-FLAMMABLE and formulated for molding SilkeMat sheets into rigid, reusable molds of the highest quality in performance. Easy to use, the Rigidizer cures at 1450° F for pot melts and vitrigraph molds, and can even be used to solidify just the outer shell of the SilkeMat mold to retain a soft, release-free interior for slumping any glass. Properly prepared and fired, all SilkeMat molds can be reused more than once.